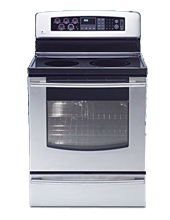 Broken oven or stove top range? Are you experiencing any of these common problems with your oven or your gas or electric cooking range? The oven has no power — won’t start! Your oven or range top problems could stem from a variety of factors including a faulty door latch, a defective infinite switch, faulty control board, bad broiling element, defective thermostat, faulty sensor, burned out bake element, failing igniter, failing convection element, or a bad convection motor. 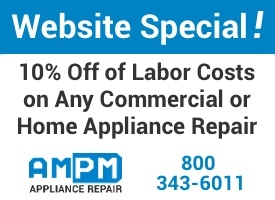 For more than 20 years, AMPM Appliance Repair has proudly served residents and businesses throughout the Los Angeles area to keep their electric and gas ovens and range top stoves operating in optimal condition. Contact us at 800-343-6011 and we’ll send one of our friendly, reliable, appliance repair technicians to quickly diagnose and fix the problem with your oven or range top stove. Our repair techs carry a vast inventory of parts for all makes and models of appliances to ensure that we can handle just about any type of residential or commercial stove, range or oven repair on the spot!